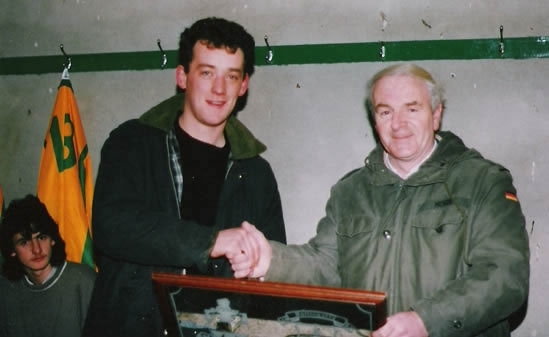 Amazingly Hartnett started his career as a goalkeeper when he played during the clubs’ first ever junior fixture in September 1984 against Askeaton B and it wasn’t until the regular centre forward, James Clancy, sustained injury late that season that Hartnett was moved up front. His first ever goal arrived in the very last game of that season against Kilfinny in a Division 2B fixture. At some point in his career he held almost every goalscoring record for the club and to this day still holds the most number of hat tricks with nine. He was the first player to score four in a game, the first to reach both the 50 goal (22/11/87 V Kilfinny (a) Division 2) and 100 goal (2/12/1990 v Askeaton A (a) Division 1) mark for the club. He was the clubs top goalscorer for six seasons on the trot from 1985/86 to 1990/91 while his 26 strikes during season 1985/86 (Div 3) and 1987/88 (Div 2) remain the most goals scored in one season by a club player. His 90 league goals is also an existing record as is his seven Desmond cup goals.Shane Hartnett An extraordinary fact from his career is that all his goals came from open play having never taken a penalty for the club or scoring from a free. He also represented the Desmond District League in the Oscar Trainor competition where he scored one goal against the Clare and District League. His nine hat tricks is still a club record having scored a hat-trick in every division he played in. All but three of his goals were scored for the clubs’ A Team. His scoring average makes highly impressive reading with his 114 goals coming during 167 games a career that spanned just nine seasons.